How much do leaders of anything need to know about the direction technology seems to be taking? There has always been a difference between understanding how something works and what it can do. We all understand where our cars can take us, but very few of us, by comparison, can speak with authority about how the internal combustion engine works. 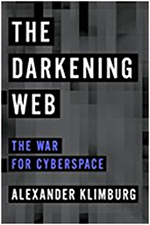 "The Darkening Web" explains the implications of many realities we know only by name that characterize the most pervasive technology of our time -- the Internet. For starters, the author convinces us that no matter how pervasive we may think it is, our wildest estimate is off by astonishing orders of magnitude. Virtually everything is connected. Defiant acts like getting off Facebook will not make you immune to its reach. This weekend we heard news reports of a falsely reported incoming missile in Hawaii. At the beginning of this book, the author references how a Soviet computer technician correctly assessed a false positive in 1983 created by a rare optical illusion. He reasoned that a single missile would not have been launched and held to his opinion even when it seemed as if four missiles were on their way, thereby correctly averting disaster. This action stands as a significant example about how human intervention prevented conflagration. The book is a cautionary encyclopedia about how nation states are turning the Internet into a domain of conflict that threatens the stability and security of our society. There is the threat to structures like the electric grid and the financial system which pervasive connectedness have made vulnerable, as well as the propaganda war in the battle for opinions and attitudes with the power to influence elections. There are insights and clarifications here. Words and phrases we have been hearing are explained: "data is the new money," "social engineering," "zerodays," the conflict over a "back door" to smart phones, the cost of "ostensibly free" services, the "metadata" debate, the different data agendas of business and government, "net neutrality," "DDoS attacks" which shut down vital services for ransom, the imbalance between offensive and defensive activities, that it is much less expensive to mount an offense than maintain an effective defense in the cyber world. "Who owns the internet?" Are "multistakeholders" losing their grip? Will the "weaponization of information" and the "routinization of information warfare" cause the liberal democracies to "forget who they are"? How often does the word "growth" appear in our strategic visions and business plans? How much of leadership is about predicting and preparing for the future? 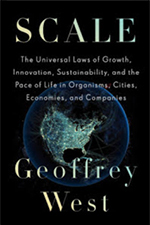 The thesis of this book is that the growth of complex systems – cities, tumors, the human body and lifespan, the different lifespans of mammals, organisms and ecosystems, businesses and non-profit organizations like yours – obey generic laws that are remarkably regular when it comes to their limitations and possibilities for growth. In the words of the author, "this book is about a way of thinking, about asking big questions, and about suggesting answers to some of those big questions." These ideas and the graphical representations that accompany them are persuasive. They make the kinds of predictions and projections we are used to making seem like sessions in front of a tarot card reader. If you’ve been reading this column for the past year you know that I don’t shrink from complex subject matter. But for this book, I honestly need more time to fully understand its message to write about it definitively, yet I did not want to delay bringing it to your attention because it is fundamentally about growth which seems to me to be the overarching concern of leaders like yourselves.